Much has been said and written in recent days about DACA, or "Deferred Action for Childhood Arrivals." Interestingly, by its terms, that program appears to contradict the REAL ID Act on the issue of whether the aliens covered by that program have "lawful status." In reality, however, it does not. As has historically been true of deferred action, these proposed deferred action programs [DACA and Deferred Action for Parents of Americans and Lawful Permanent Residents (DAPA)] would not "legalize" any aliens who are unlawfully present in the United States: Deferred action does not confer any lawful immigration status, nor does it provide a path to obtaining permanent residence or citizenship. Grants of deferred action under the proposed programs would, rather, represent DHS's decision not to seek an alien's removal for a prescribed period of time. Each of these authorities is clear as it applies to DACA that "deferred action" for purposes of that program does not constitute "lawful immigration status" or "lawful status" under the immigration laws. Passed by Congress in 2005, enacted the 9/11 Commission's recommendation that the Federal Government "set standards for the issuance of sources of identification, such as driver's licenses." The Act established minimum security standards for state-issued driver's licenses and identification cards and prohibits Federal agencies from accepting for official purposes licenses and identification cards from states that do not meet these standards. Section 202 of that act establishes minimum document requirements and issuance standards for federal recognition of a driver's license or identification card issued by a state. Section 202(c) of the REAL ID Act delineates those "minimum issuance standards." The conference report (H. Rept. 109-72) for the bill that was passed as the REAL ID Act, H.R. 1268 (2005) makes clear, the "special requirements" in section 202(c)(2): "[R]equires a state, before issuing a driver's license or identification card to a person, to require a person to present valid documentary evidence that he or she is either a U.S. citizen or national or an alien legally present in the United States." (Emphasis added). The evidence of Legal Status [sic] requirements conform almost exactly to those of the laws of the Commonwealth of Virginia, and are parallel to the state laws of New York, Florida, California and roughly thirty other states which have passed laws requiring evidence of lawful presence in the United States. It requires for state license and ID cards verification that an applicant is lawfully present (not present in violation of the Immigration and Naturalization Act) in the United States before issuing a driver's license or personal identification card that is intended to be used for identification purposes by federal agencies. Under this section, persons would only be eligible for temporary drivers' licenses or identification cards if evidence is presented that they: (1) have a valid, unexpired non-immigrant visa or non-immigrant visa status for entry into the United States; (2) have a pending or approved application for asylum in the United States; (3) have entered into the United States in refugee status; (4) have a pending or approved application for temporary protected status in the United States; (5) have approved deferred action status; or (6) have a pending application for adjustment of status to that of an alien lawfully admitted for permanent residence in the United States or conditional permanent resident status in the United States. By its terms, among the "special requirements" in section 202(c)(2)(B) of the REAL ID Act for issuance of a compliant driver's license or identification card is "[e]vidence of lawful status." With respect to this requirement, section 202(c)(2)(B)(viii) states: "A State shall require, before issuing a driver's license or identification card to a person, valid documentary evidence that the person--has approved deferred action status." What the foregoing authorities make clear is that aliens with DACA status are "lawfully present" in the United States, but also that they do not have "lawful status." This would appear, at first blush, to contradict the plain language of section 202(c)(2)(B) of the REAL ID Act. Notably, however, the conference report makes clear that act only intended that driver's licenses and identification cards would be accepted for Federal purposes if they were issued to an alien "legally present in the United States." In the context of section 202(c)(2)(B) of the REAL ID Act, therefore, the term "lawful status" is simply used to mean "lawful presence." The apparent contradiction is, accordingly, merely semantics. Why the confusion? 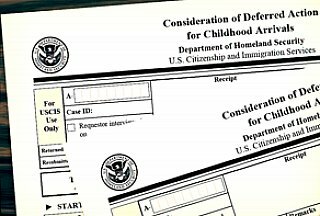 The simplest explanation is the fact that, in 2005 when the REAL ID Act was passed, Congress did not envision that any future administration would use the "deferred action" authority to legalize hundreds of thousands of aliens who are unlawfully present and who do not have any expectation of receiving "lawful status." "Lawful status" was, therefore, just harmless shorthand for the status of anyone "lawfully present in the United States" under the immigration laws; it did not, in any way, affect those aliens' status. If that act were to be drafted today, Congress would plainly not use the same language. This may, however, be a point for the legislature to clean up in any future immigration legislation.